Get with the beats, the riffs, the harmony, or if you wanna go to hell, Phil Collins. Back on Steve/Joe's ARC board, we had this topic. I thought it would be a fun topic to bring back. For one, it would make us see how much our taste has changed since then. Also, for me, the original list I pretty much threw together in like 2 minutes, didn't even really think about it. So, I'll start it off, listing my top 25 favorite songs. Good gravy. Last time we did this, it was about our iPods or what we had on our computers. Just a wee bit different. 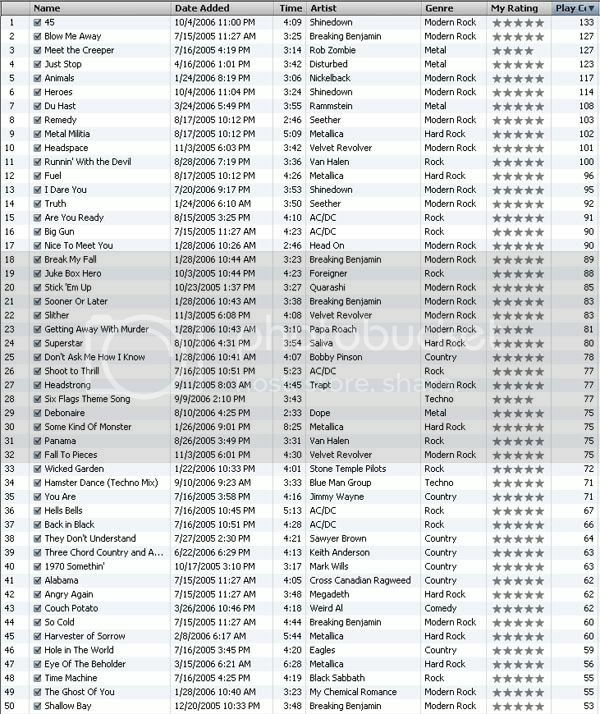 Uh yes, it started out as Top 25 iTunes songs played but ti pretty much became your favorite songs. im a loser when it comes to music. I couldn't think of how to rank my favorite songs, what with nearly 8000 to choose from, so I just decided to go through my Last.Fm page's Top 25 artists, and pick my favorite songs by them. Wait until you hear Philip's list. I just realized that I didn't put any Iron Maiden on my list. Let's say that Aces High is number 26. Hey, I saw Rhapsody in Blue on that list. Great song. I heard Hurt by Nine Inch Nails. It's pretty interesting actually, I didn't think it'd be that slow. I still prefer the Johnny Cash version though. Haha, I bet you knew I was gunna say that. I love Motorhead and Megadeth, though I only have a few of their songs. Yes, everyone's favorite band is #1 on my list..lol. Pretty much mine is all modern rock/ hard rock with some country at the top. Ah damn, Runnin' with the Devil should be somewher in the top 10, oh well, I don't feel like modifying it now.